Hercules (Reg Lewis) battles a swarm of huge, hydra-headed dragons to save the residents of a remote village. Also stars Margaret Lee and Luciano Marin. And with Andrea Aureli, Birgit Bergen and Nello Pazzafini. (In widescreen format). Hercules (Brad Harris) must fight an evil tyrant who has taken over the land of a beautiful queen. Also with Mara Berni and Alan Steel. Hercules (Brad Harris) must fight an evil tyrant who has taken over the land of a beautiful queen. Also with Mara Berni and Alan Steel. (In German language and widescreen format). NOTE: This rare German language import print has far superior picture quality than the English language U.S. version. This sword and sandal spectacle was directed by Jacques Tourneur of Val Lewton fame and features cinematography by Italian horror master, Mario Bava. 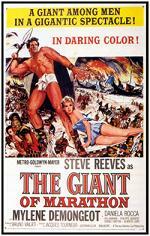 Steve Reeves plays a courageous Greek hero whose muscle-bound heroics are the source of deadly frustration for the invading Persians. Plenty of excitement and adventure in what is considered one of Reeves' best films. This film comes from a nice widescreen import print. Muscleman Ohro (Gordon Mitchell) travels to the sinful capital of Atlantis to rebuke its godlessness and hubris and becomes involved in the battle against its evil lord Yoh-tar and his hideous super-science schemes. Spectacular battles highlight this gladiator epic. Rome is menaced by a secret weapon, and the city's top soldiers discover exactly what it is: A giant catapult with lots of Gauls, and only Claudius Marcellus (Richard Harrison) can stop them. In order to placate the angry gods, who have allowed Thessaly to be overrun with barbarian invaders and beset with natural disasters, King Jason (Roland Carey) takes his Argonauts on a search for the fabled Golden Fleece. Meanwhile, back at home, his scheming regent is plotting to get his hands on the kingdom-and the queen. Comes from an Italian widescreen import print of excellent picture quality. 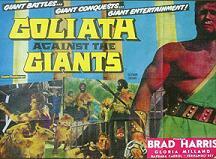 In this adventure, Goliath (Brad Harris) battles sea monsters, a horde of giants and a tribe of Amazonian warriors. Also stars Gloria Milland. Taken from an excellent widescreen import print. Goliath (Mark Forest) must battle giant bats, three-headed dogs and a vicious dragon to save his wife and his country from an evil ruler. 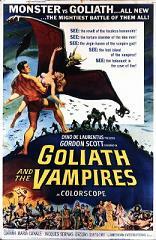 Also stars Broderick Crawford and Gaby Andr�. When the city of Nefer is forced by conquering Babylon to pay a tribute of virgins, in strides Goliath (Mark Forest) to compete in a chariot race and free the put-upon maidens. This wild Italian action-adventure co-stars Jose Greci, Giuliano Gemma and Erno Crisa. Goliath (Gordon Scott) must save the kidnapped women of his village from an evil zombie leader who needs their blood to feed his soldiers. Also stars Leonora Ruffo and Gianna Maria Canale. For the last two decades of his life, Gordon Scott was a popular guest at film conventions and autograph shows. His manner of making a living for the last forty years of his life is unclear. Aside from autograph shows and selling occasional souvenir knives, he did not seem to have been employed. He spent much of his final years living with fans who remembered him from his Tarzan days. Scott died on April 30th, 2007 in Baltimore, MD at Johns Hopkins Hospital, from lingering complications due to multiple heart surgeries earlier in the year. Estranged from his family, he was survived by two sisters and a brother, none of whom had seen him in years. 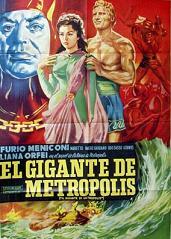 The muscular Hercules (Steve Reeves) sails with the Argonauts and romances the fair Iole. In this melange of characters and events from separate mythological stories, Hercules, demigod and superman, arrives in the ancient Greek kingdom of Iolcus to tutor Iphitus, son of king Pelias. Immediately on arrival he falls in love with the king's delectable, briefly-clad daughter Iole (Sylva Koscina). But before he can win her he must succeed in a series of quests, in the course of which he teams up with Jason, true heir of Iolcus, whom he accompanies on the famous voyage of the Argonauts. 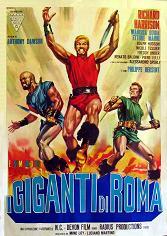 This film was the first in the long running Italian sword and sandal Hercules epics. This film comes from an excellent widescreen import print. 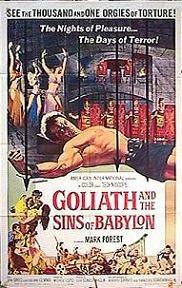 Glaucus (Gordon Scott), the prince of Tiryns and a powerful warrior, goes undercover in Mycenae to infiltrate the evil cult of Moloch, which is exacting tribute from neighboring kingdoms in the form of attractive young hostages, both male and female. Calling himself Hercules, Glaucus defeats Mycenae's champions and gains the favor of the voluptuous Queen Demetra (Rosalba Neri) whose son, covered in a dog's head mask, has been raised as the living embodiment of the dark god Moloch and receives sacrifices in his sprawling underground grotto. Princess Medea (Alessandra Panaro), a proponent of a rival religion devoted to the Earth Goddess, makes contact with Glaucus and helps him set up an elaborate plan for opening the walled city's gates to an invasion by the army of Tiryns. In ancient Greece a race of evil aliens from the moon land on Earth. For years they've terrorized the nearby city of Samar, demanding children for sacrifice. Now, the queen of Samar has made a pact with the moon men to conquer the world and become the most powerful woman alive. However, the residents of Samar, sick of all the chaos, cheer when the mighty Hercules (Alan Steel) shows up to put a stop to it all. Hercules (Mark Forest) is rescued by Prince Maytha (Giuliano Gemma) and his warriors. Ata Hualpa (Franco Fantasia) is an evil Inca king who is trying to sacrifice Princess Yamara (Anna Maria Panaro) to the Sun God. Hercules and Maytha must then save her and defeat the despotic king. Mark Forest (aka Lou Degni) used the money he earned from making gladiator films in Italy to study Opera. As of 2004 he teaches opera and is a personal trainer in the Los Angeles area. Alan Steel stars as Hercules in this weird time-traveling romp in which the strongman enters the Elizabethan era battling pirates on the bounding Main. Also stars Rosalba Neri and Piero Lulli. 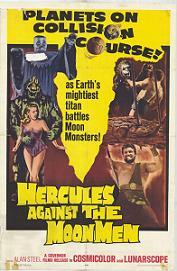 Hercules (Reg Park) saves a beautiful maiden from the hands of an evil creature. She then takes him to her home, Atlantis. There Herc saves her from her mother who wants to kill her and from some scary-looking blond guys. But unfortunately the rest of the inhabitants are destroyed. Hercules then escapes along with his son, the maiden and a midget. 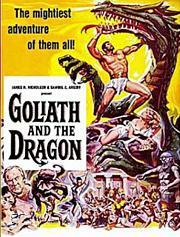 Superstrong hero Hercules (Gordon Scott), aided by young Ulysses (Mart Hulswit) and scientific wit Diogenes (Paul Stevens), journeys to Troy where the city's virgins are being sacrificed to a horrible sea monster. When Princess Diana (Diana Hyland), heir to the Trojan throne currently being held by her evil uncle Petra (Steve Garrett), is selected to become the sea monster's next victim, Hercules must battle the monster - and Petra's warriors - in order to save her. Also with Gordon Mitchell. 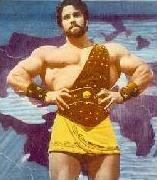 Hercules (Reg Park) sets out on a quest to save his son's soul from the evil Earth Goddess Gia. He must battle all sorts of monsters, get past numerous obstacles and resist temptations if he is to save his son. What Hercules doesn't know is that while he is away, Gia sends Antaius (her rotten son) to impersonate Hercules. Antaius reigns over the people as a cruel, heartless king. Can Hercules get back in time to save the people? Hercules (Reg Park) must journey to Hades itself to retrieve the magic stone that will free his love from the powers of darkness. Upon his return from battle in the previous film, the great warrior Hercules learns that his lover, Daianara, has lost her senses. Acording of the oracle Medea, Dianara's only hope is the Stone of Forgetfulness, which lies deep in the realm of Hades. Hercules, with two companions, Theseus and Telemachus, embarks on a dangerous quest for the stone, unaware that Dianara's guardian, King Lico (Christopher Lee), is the one responsible for her condition and plots to have the girl for himself as his bride upon her revival.